If you are in search of the best belt sander, it’s essential that you choose the right one for the job. Sanding is often seen as a boring and dull task, but it’s something we must do. That’s why we’ve put together a full list of belt sander reviews, so you know what to buy when it’s important to get the job done quickly. Belt sanders are heavy duty tools that make a surface smooth. They are used on large wooden surfaces such as floors, decks and kitchen cabinets. The best belt sander is your workhorse and rapidly removes wood when needed. They aren’t like an orbital sander which is good for smaller projects. In fact, there are some woodworkers who don’t want to use belt sanders because they take off a good chunk of material quickly. With a little practice, however, you can quickly become a pro at using this handy tool. You’ll soon find that the best belt sander helps you to shape, round edges and remove excess wood until it’s a smooth finish. Another common way to use the best belt sander is by grinding your metal tools to sharpen them. Many people don’t realize that they are good for that, so it’s a little hack. Just don’t settle for the first belt sander you see, make sure you read all the reviews and specifications to get the one that will work for you. 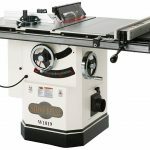 How Much Does the Best Belt Sander Cost? If you are a professional or plan to use a belt sander often, then you need to invest in one with power. That’s why the best belt sander for you is going to have more than 8 amps of power. Keep in mind that many of these will also come with a higher price tag, but the features and quality are going to be worth the cost. This powerful belt sander from Hitachi comes with a fantastic price considering the force behind it. It’s a 3 x 21” belt sander, so it’s one of the most popular sizes available. It also has some amazing features. The variable speed dial is easy to use and adjusts the speed from 820 ft/min to 1,475 ft/min. That allows you to get through your jobs quickly. There’s also a soft gripping surface on the sander’s handles making it comfortable plus secure while working. The tracking window is useful and improves your visibility of the sanding surface plus the belt while operating. With the dust collection bag mounted on the left-hand side of the sander, you have better control over corner sanding applications. It also comes complete with a wear-resistant V-belt which drives the sander. This design doubles the machine’s life. It weighs 9.5 pounds which is a typical weight for a belt sander this size. It also comes with a five-year warranty and 30-day satisfaction guarantee which is impressive. Some people have complained about an accidental electrical shock occurring at times. This seems to be a fault in the design. In addition, it isn’t quite as balanced as some of your more expensive models. This Makita belt sander is expensive, but we think you’ll see quickly why it’s one of the best belt sanders. It features a powerful 8.8 amp motor which is going to help you achieve most woodworking projects with ease. The electronic speed control allows you to maintain constant speeds while under load. It also contains a wide speed range for maximum versatility. This option for the best belt sander has a low-profile design for superior balance. In addition, the extended base design allows you to sand flush to your wall. For comfort, it comes with a larger front grip than some other machines. It’s also a reasonable weight at 9.5 pounds, so it won’t be too heavy during long operation. The auto-tracking belt system enables you to avoid adjustments while still providing you with accuracy. This is a great belt sander for most deck builders, carpenters, general contractors and woodworkers. Even though it has a powerful motor, it still only runs at 85dB which isn’t that loud for a power tool. It also comes with a cloth dust bag for easy collection. For the price, we would’ve liked to see a longer warranty term. It only comes with a 1-year at this time. When you need the best belt sander for larger workpieces, you want this option from Makita. Its belt measures 4 x 24 inches and the single speed of 1,640 feet per minute is fast enough for quick material sanding. It’s also one of the quietest on the market with just an 84db noise rating. This power tool will remain in your workshop for a long time thanks to the high-quality construction. There was exceptional care taken to protect and seal the unit’s bearings and motor. In addition, it’s comfortable to use. That’s because it offers a large front handle that’s easy to grip. With the 360-degree dust bag that swivels, you’ll find operating the belt sander is convenient as well. This unit does look a lot like the Makita 9903, but they are entirely different. First, the 9903 has variable speed controls, but the 9403 offers more speed and power with its 11 amp motor. With that in mind, it also weighs more as well. Unlike the other heavy-duty options that were around 9.5 pounds each, this one weighs 13 pounds. You are also going to pay a slightly higher price to get power like this, but the good news is that it comes with a one-year warranty. If you want the best belt sander, but you don’t feel like you need the top of the line, looking in the seven to eight-amp range might suit you. This allows you to still get a quality belt sander at a fraction of the cost. Most of these offer plenty of power for the average home user and light-duty professionals. You don’t need to spend a fortune to get the best belt sander for occasional use. This option allows you to have an affordable belt sander that works great on most common projects. It only weighs 6.5 pounds, so it’s lighter to hold than the heavy-duty models. This is ideal for tasks that require more extended periods of sanding. It also has a 7-amp motor which isn’t the most powerful on the list, but surely enough for most homeowners. The speed runs at 800 feet per minute, but there are no variable options available. This innovative front roller design allows users to reach into tight corners with ease. There’s also a retractable three-position handle which gives more control than some other options. Another perk is that it comes with a dust collection system to keep your area clean and debris free. For the price, you really can’t beat this power tool. To top it all off, the manufacturer provides a two-year warranty which is more than could be expected. Variable Speed for incredible versatility | Control the speed of sanding with the variable speed feature! Here’s another affordable option when looking for the best belt sander. It uses a 3 x 21-inch belt running on an 8-amp motor. There are variable speeds from 290 to 1180 feet per minute. That’s what makes it so good at tackling delicate projects as well as the heavy-duty tasks as well. With the low profile design, you have maximum amounts of versatility, especially when dealing with tight areas. When you need to change the single lever belt, it’s convenient and quick. With the adjustable front handle, controlling this sander is simple to do. With the auto-tracking belt system, you can track the sander’s belt without making any adjustments. There’s also a dust bag for collecting debris, but it isn’t as useful as some other options. It does weigh 8.5 pounds, so it’s slightly larger than some of the other mid-sized options. With the price, this sander can’t be beat, especially for common household jobs. In addition, it features a full two-year warranty for additional peace of mind. The best belt sander on a budget is the WEN 7-amp model, but the great price isn’t all this machine offers. It’s lightweight at just 6.2 pounds and compact for easy portability. The 7-amp motor isn’t the most powerful on the market, but surely enough to get basic jobs done. It spins at 820 feet per minute so you shouldn’t have an issue completing any regular sanding task. In addition, the front roller located on the sander extends past the edge so you can easily get into tight corners. With the tool-free belt change, you minimize downtime, plus there’s a lock-in safety feature that allows for continuous sanding without needing to hold down the trigger. This budget-friendly model even comes with a dust collection bag which keeps your workshop clean and tidy. Surprisingly, this machine also comes with a two-year warranty. We never expected to see that kind of protection on a model this inexpensive. This high-end option is a great contender for the best belt sander. It’s on the higher side of the mid-range options but has features like a professional sander. That’s why it also comes with a more expensive price tag. This 3 x 21-inch sander includes variable speeds that range from 850 through 1,300 feet per minute. This allows you to handle delicate tasks and large-scale projects as well. The impressive drive system transfers power from the unit’s motor right to the sanding belt. There’s also a fingertip belt-tracking knob plus a quick-release belt-change lever. The motor is over the plate for perfect balance and maximum performance. This sander is a little heavier at 10.75 pounds, so it can become cumbersome after long periods of sanding. We had also hoped that there would be a longer warranty on it due to the higher price, but there’s only a one year. On a brighter note, they do have a 30-day performance certification. It also comes with a dust collection bag. If you aren’t planning to use your belt sander often, then there’s no need to spend a lot of money in order to get the best belt sander. You’ll find the lower powered options are just as good for your smaller tasks. The power is lower, so the jobs won’t get done as quickly, but the average homeowner would rather save money. This lower end belt sander is one of the lowest priced on our list, but it also has the lowest amount of power. That doesn’t stop people from giving it rave reviews. This 3 x 18-inch belt sander is easy to use and perfect for your occasional task. Despite the lower price, there are still some features that add extra functionality to this sander. The Pressure Control Technology warns you when you apply too much pressure. That’s a helpful addition when working. The Auto Track System helps to keep your belt on track and centered at all times. It doesn’t have a dust collection bag, but there’s a see-through dust canister that does a decent job of collecting fine dust particles. You also have a quick operation with the single lever belt changes. This belt sander does weigh 5.25 pounds, so it’s the lightest on our list as well. This is great if you are looking for portability or you need to use the machine for a long time. What we couldn’t find about this model is any information about a warranty. For the price, that’s not really something to complain about. This isn’t a new sander, but still worthy of being called the best belt sander, especially if you need a lower power version. Many people like this 3 x 18-inch model. That’s because of the numerous features it comes with. The twin fan design for dust collection is efficient and worthy of paying more for. One fan cools off the motor while another collects all the dust. It’s also comfortable to use with the soft grip handles that decrease vibration and increase comfort. This sander has a long 12-foot long rubber cord so you have more versatility while working on projects. The automatic belt tracking tool adjusts your belt to the center of the plate to keep you aligned. The 6.5-amp motor is belt and gear driven which offers you enough power to handle most household projects. This sander is slightly more expensive than we would have thought for a refurbished 6.5-amp unit. They put right in the description that the belt sander might come with some scratches, scrapes or blemishes, but that everything will be in good functioning order. On the plus side, it does still come with a one-year warranty, which is unusual for a refurbished item. Reading the best belt sander reviews is the best way to find what you need, but it’s critical you understand the differences between the different belt sanders. There are two main types to consider: the stationary belt sander and the handheld belt sander. Each one of these varieties features it’s own list of pros and cons. This belt sander remains in one place and you take your woodworking piece to it for sanding. With this type, the belt rests on top of the machine. These are heavier and larger models compared to a handheld version but are almost always more powerful. It’s easy to mount the stationary sander on a workbench. When you do this, it’s often referred to as a bench sander. While they are usable for metal or wood pieces, most of the time they are purchased for larger commercial projects. This is the most common type of belt sander and usually is what the home user purchases. They come in many shapes and sizes but are normally always lighter and smaller than a stationary sander. The sanding belt is found on the bottom of the machine. It is the ideal option for sanding down stationery items such as floors. There are several different belt sizes with a handheld sander and many of them also have variable motor speeds. This makes the tool more versatile than the stationary variety and offers more control over the project. A few handheld sanders also work upside down for use as a stationary sander. The belt sander works well for most sanding projects, but you need to pick the right one. Here are the factors to consider when searching for the best belt sander. Sanding doesn’t often require a ton of power, but it’s still important to choose one that has a powerful enough motor. Some will be as low as six amps while others feature 10 amps and more. The more powerful your motor is, the more efficient the job gets done. You’ll perform better with a higher powered belt sander than one with low amperage. The tradeoff is that they will cost more too. Most belt sanders come in two main dimensions: 3 x 21 inches or 4 x 24 inches. The smaller one is the most popular because the compact size makes woodworking projects easier. They are simple to handle and quite portable as well. The larger option is good when you need to complete larger surfaces or you need a heavy-duty sanding machine. Most people that need a versatile option, go with the 3 x 21-inch design. Weight should always be considered when looking for the best belt sander. If your tasks require use in the horizontal position, you’ll do best with a heavier option, especially if you are sanding misaligned boards. When working on overhead projects or vertical jobs, the lighter belt sander is easier to handle. Some come as light as five pounds while others will weigh more than 15 pounds. You have the option to pick between a single speed sander and variable speed machine. The single speed units are older and are limited to what they are good for. The variable speed units adjust to fit any project. Most speed ranges are between 500 and 1,500 feet per minute. Some of the models will only have two-speed settings while some others have a dial which allows options to choose the speeds in between. Belt sanders produce a good amount of dust. If this isn’t accounted for, it leaves users with a lot to clean up once the job is over. Look for a belt sander that has an efficient dust collection system. An onboard dust bag or canister is a nice addition, but you want to make sure it’s big enough that you don’t have to empty it continually. There are some belt sanders that feature a dust port so you can connect it right to the shop vac. These are your best option in terms of dust collection and ideal if you plan to use your machine often. If you are on a budget, then you’ll be able to find a low-cost belt sander for around $50. There are some quality brands that make lower cost belt sanders. To invest in a higher quality option, you can expect to pay anywhere from $200 to $250. The main difference in pricing is the quality of construction. You’ll have more durable materials in the design and motor when you invest more money. In addition, they are usually more powerful as well. If you are simply doing a deck or some floors, you don’t need the best belt sander that costs a lot of money. Instead, opt to purchase a lower-end model and you’ll still find that it gets the job done. Most homeowners aren’t using their belt sanders like a professional. If you haven’t been sanding long, then understanding the different options might be confusing. Each one has its own purposes, so it’s important to understand the differences. With a belt sander, removing a large amount of wood quickly is easy. It’s the ideal choice for large tables and floors or decks. Sometimes you’ll hear these called finish sanders. They fit into the palm of your hand, hence the name. You’ll use it for a smooth finish at the end of a project. Basically, it holds sandpaper to the bottom of its circular or square pad. This is held on with a clamp. Once powered on; this sander works in smaller circular motions to create the smooth finish you desire. Not only are they good for detailed finish work, but also to get into smaller areas or corners with ease. The problem with this option is that unless you are skilled, you might leave circular marks on your surface. This isn’t a look most people desire, so it’s often wise to avoid palm sanders, especially if you aren’t experienced. With a random orbital sander, not only can you move in circular motions, but also random movements. This prevents you from leaving circular motions on your surface area. These are the most popular sanders on the market. We believe that a 3-inch belt is the easiest to control and use. A four-inch sander is cumbersome and normally only chosen by professionals. Belt sanders tend to be safer than many power tools, but it’s still important to take safety measures for your protection. Wear hearing protection because belt sanders are loud. Don’t breathe in the dust. It’s dangerous and unpleasant. If you can, wear a dust mask. If your machine doesn’t have dust collection, prepare to clean with a shop vacuum. Don’t change the belts or empty your collection bag while the tool is plugged in. If you are using the sander on metal, there will be sparks. This could lead to a fire if mixed with sawdust. Make sure you clean out the sander thoroughly prior to using it on metal. Turn off the trigger before plugging in the sander. This might sound elementary, but many belt sanders come with a button that locks the trigger on. Secure all your work when sanding. Otherwise, it might slide away from you. Clamps might get in the way, but they keep it from sliding around. Sanding is a great way to accomplish most woodworking projects, whether it’s for renovations or home improvements. Investing in the best belt sander allows you to make the work easier and more professional looking. You need to purchase a reliable sander if you want it to last for many years. Don’t forget to consider the power, belt size, speed and weight before making that purchase. When you think about all of these factors, you can’t go wrong with the newest addition to your tool arsenal. You might even find yourself looking for new projects to sand.